Ahh, the Academy Awards. The most glamorous event of the year was back for its 91st edition on Feb. 24, 2019, and Hollywood's hottest stars did not disappoint in the sartorial department. Although some did miss the mark. Before the golden statues were handed out, celebrating the biggest achievement in film in 2018, Hollywood's finest donned their sharpest attire and descended upon the Dolby Theatre in Hollywood. Lady Gaga continued her winning streak, Regina King showed off some major leg, and Charlize Theron left us speechless with a stunning surprise transformation. The red carpet also saw some, erm, not so hot choices, as Melissa McCarthy played it a little too safe, Glenn Close morphed into a trophy, and Sarah Paulson made our jaws drop … for all the wrong reasons. But more on those misses in a few minutes. 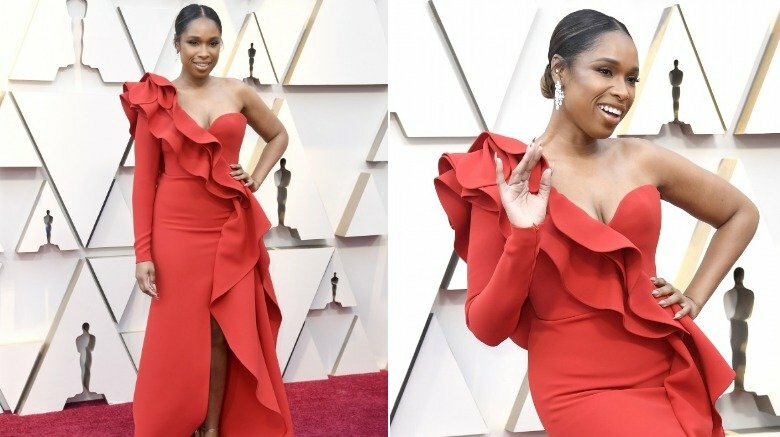 Here are the best to worst-dressed celebs at the 2019 Oscars. She may not have been nominated for any awards, but Charlize Theron easily took home best dressed of the night. Debuting what E! dubbed her "most dramatic makeover yet," the Oscar-winner — best actress for 2003's Monster (which also included a jaw-dropping transformation, FYI) — absolutely slayed the red carpet. Donning a pale blue Dior dress with structured shoulders and a daring cut-out (the back was all skin! ), the 43-year-old beauty completed her look with layers and layers of gems. From her three-strand snake necklace to her matching bangle, numerous rings, and oversized emerald earrings, the actress was dripping in Bulgari diamonds. As for the hair, gone were her blonde locks, replaced by a bold brown bob, which was actually the result of a last-minute decision. A couple of hours before the ceremony, hair stylist Adir Abergel posted a snap of him cutting Theron's hair, which he cheekily captioned: "Decided to chop it all off before the big moment." 2018 was the Year of the Lady. Lady Gaga, that is. Mother Monster dominated the box office, then awards season, with her powerful and moving portrayal of Ally in A Star is Born. The flick grossed a whopping $423.5 million worldwide and earned Gaga multiple awards for her impressive acting chops. It also ushered in a more subdued pop star. 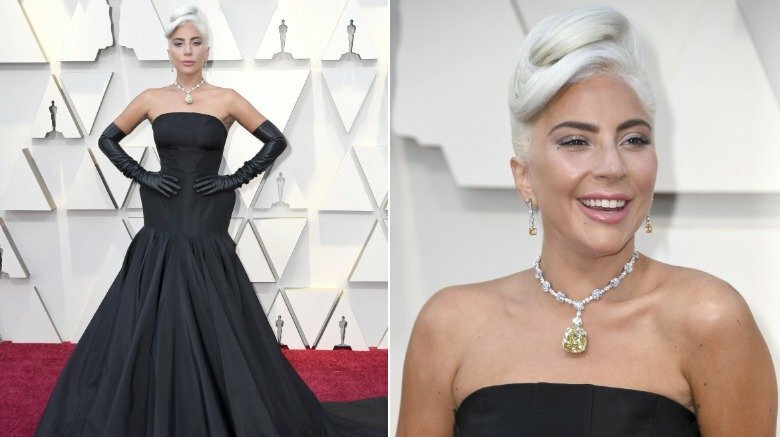 Whether she was attending the Golden Globes or the Grammys, a 32-year-old Gaga showed off a more subtle side of her bold style, finding a happy medium between statement-making and classic. This time around, she wore a black gown by her late friend Alexander McQueen, reported Elle. The frock delivered plenty of wow factor, however, with its dramatic structured hips. Also, can we talk about the elbow-length leather gloves? Those were pure Gaga. 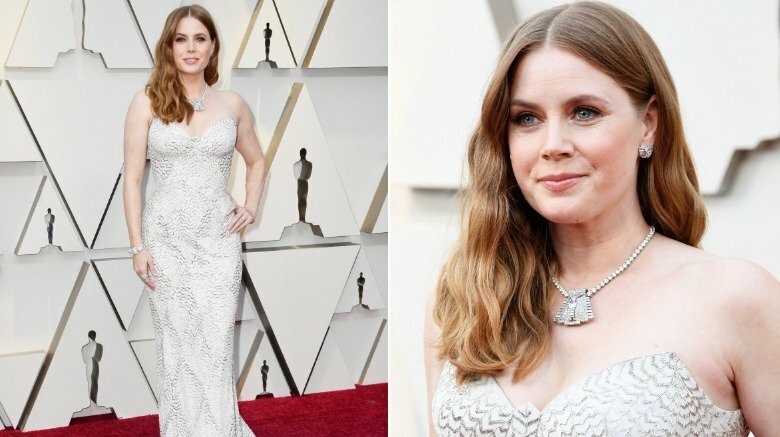 Taking the look to the next level was her stunner of a necklace, featuring 100 carats of white diamonds holding a rare 128.54-carat yellow diamond. According to Harper's Bazaar, the show-stopping jewel from Tiffany & Co. has only been worn publicly three times since being discovered in South Africa in 1877. Usually locked up at Tiffany & Co.'s flagship store on Fifth Avenue, it was previously worn by none other than legendary actress Audrey Hepburn as she posed for Breakfast at Tiffany's publicity shots in 1961. 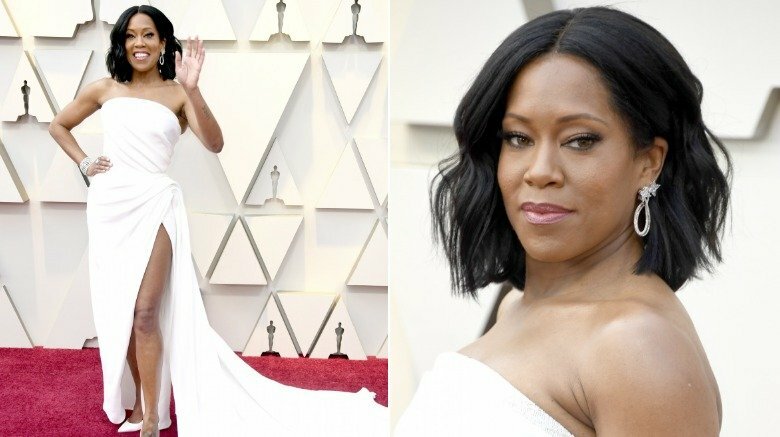 As Regina King stepped on stage to accept her award for best supporting actress for If Beale Street Could Talk, she delivered an emotional speech and a big dose of wow. Looking mega glamorous, the 48-year-old not only went down in history with her win, but she also solidified her status as "the queen of the leg slit" and gave past Oscar-winner Angelina Jolie a run for her money, as E! so rightly pointed out. Opting for a white strapless Oscar de la Renta gown with a cinched waist, dramatic draping across the bodice and hips, and a slit that went up to there, King revealed that her daring sartorial choice just made sense. Speaking with Ryan Seacrest on the red carpet, she said, "I just felt like this film is about the fabric of America — the pieces, the threads of America — and Oscar de la Renta is an American designer, and I just felt it was appropriate." Va-va-voom! Amy Adams may have completely transformed herself to step into the shoes of Lynne Cheney for Vice (so much so that she received her sixth Oscar nomination for the role), but she was a completely different person as she arrived on the red carpet. Not only was the short bob from the film nowhere in sight, but she decided to do a total 180 and go full vixen on us. The supporting actress nominee made jaws drop in a fitted Versace gown that hugged every single curve beautifully. Not only was the white and silver gown cut in a mermaid silhouette, but its pattern made Adams look like a real-life mermaid. To complete the look, the 44-year-old added even more elements of sparkle with platinum and diamond jewelry, all courtesy of Cartier. According to Hollywood Life, this included vintage earrings from 1934, a clip brooch from 1935, a bracelet from 1937, and a huge Cartier High Jewelry Tennis necklace. When Jennifer Hudson hit the stage to perform best original song nominee "I'll Fight," the title track from the Ruth Bader Ginsburg documentary titled RBG, many were excited to hear the Oscar-winner sing. Unfortunately, her rendition of the track was soon slammed for being "flat" and "off-key" with one viewer tweeting: "I'm sending Jennifer Hudson a bill for breaking all the windows in my house with that performance." Another added: "Jennifer Hudson sis!!! They key sis! The key!!!" Ouch! It wasn't all bad, though. Luckily, Hudson hit a home run on the red carpet, as she showed off some serious sass. Picking a dress straight off the runway, the 37-year-old rocked a bold and beautiful creation from Elie Saab's SS19 Couture, which E! noted made her look "like the dancer emoji — in the best way, of course." Of course. While plenty of celebs were opting for pink gowns this year, the songstress went against the grain and opted for bright red paired with an unexpected cut. The unique shape featured an asymmetrical design with one sleeve, a thigh-high slit, plenty of ruffles, and a curve-hugging silhouette. Way to hit it out of the park, JHUD! Just call her America's Sweetheart. 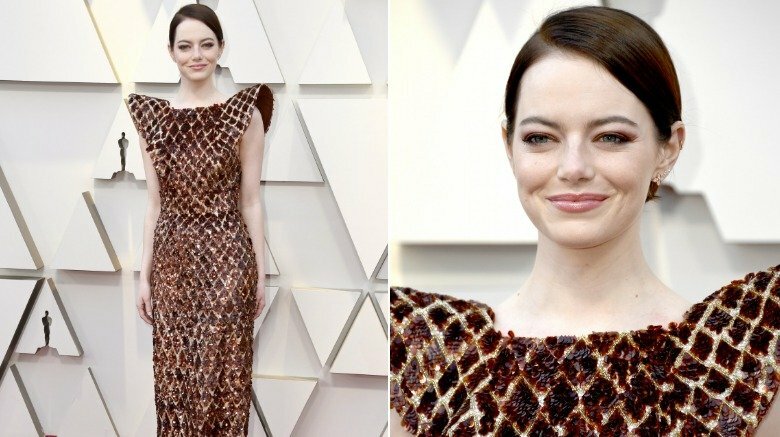 Miss Emma Stone, 30, has practically grown up in front of our eyes and blossomed into a real fashionista, as she proved again at the 2019 Academy Awards. The supporting actress nominee (who was recognized for her role in The Favourite) represented Louis Vuitton (she was chosen as an ambassador for the brand in October 2017) and scored top marks in a dazzling frock that reportedly took more than 700 hours to make. The burgundy floor-length gown, which gave off some futuristic alien vibes with its exaggerated spiked shoulders, was completely covered in sequins, pearls, and beads and, as People learned, "the embroidery took 712 hours plus 22 hours to adjust it after shrinkage." What's more, "it was quite difficult because the design was geometrical and we had to reduce and increase the elements dimensions without changing their total number." Unfortunately, not everyone was feeling the love. One critic compared the movie star's dress to a waffle and another to burnt toast. Eek! The world has come to know and love Melissa McCarthy as a comedy star with impeccable humor and timing, which made her latest film, Can You Ever Forgive Me?, all the more impressive. First nominated as a best supporting actress for 2011's Bridesmaids, the Gilmore Girls alum's second nod from the Academy was for an even higher honor — best actress. Unfortunately, she chose to celebrate the momentous occasion in a look that underwhelmed, big time. 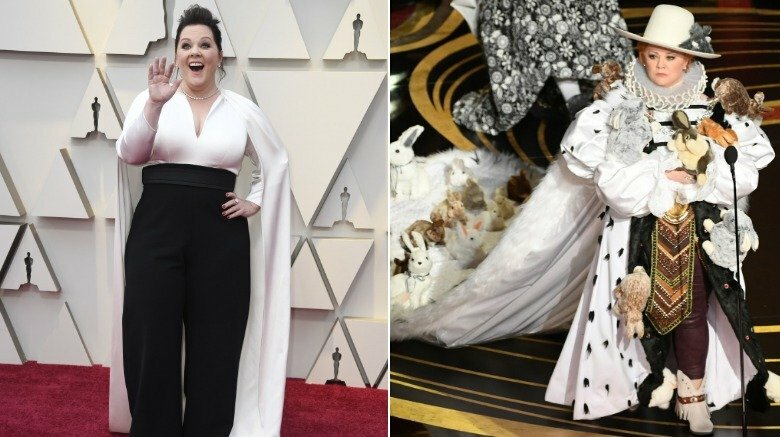 Donning a custom Brandon Maxwell creation, McCarthy, 48, walked the red carpet in a silky white blouse with a cape (Okay, maybe the cape deserves points) paired with black trousers. Was it a two-piece or a pantsuit? We're not sure, but it doesn't really change the fact that the actress looked like she was ready to attend a board meeting at her 9-to-5 office job. If only she would have worn the plush bunny-covered cape, royal collar, and wide-brimmed hat she donned to present (pictured right). Oh, Rachel, what happened? The 48-year-old British actress may have snagged an Oscar nom for her supporting role in The Favourite, but she sure wasn't winning any awards on the fashion front. 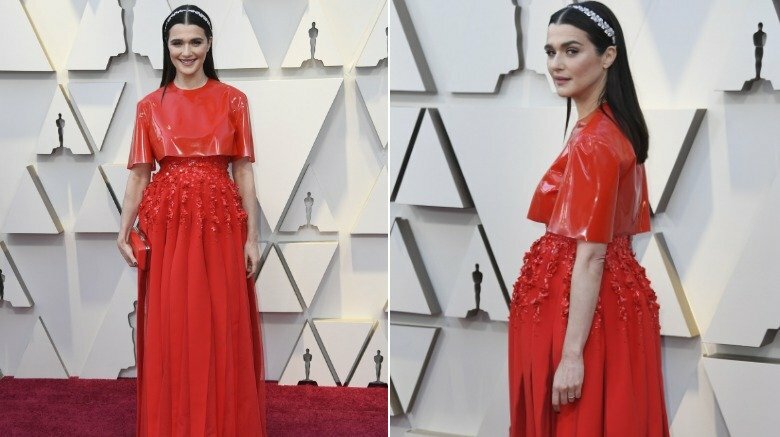 Stepping out in a blinding bright red Givenchy Couture gown, Weisz looked more ready to attend an audition for The Handmaid's Tale than the biggest awards show of the season. Comprised of two pieces, the look featured a floor-length dress with sparkling embellishments across the hips, which appeared to be arranged in a flower pattern, that was then covered with a bizarre latex caplet. Take that element away and the look may have been a home run. Instead, it tried — and failed — to give off a layer of unnecessary edginess, which was then completely negated by a sweet headband (actually two vintage Cartier feather pins from 1903, according to People) reminiscent of a young schoolgirl's look. There's something to be said for positive thinking and vocalizing your inner thoughts out into the world, but that doesn't necessarily mean transforming into what you desire. 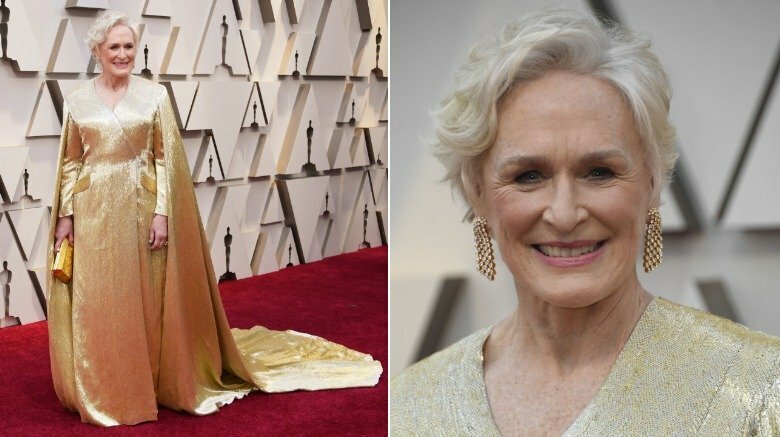 Glenn Close seemed to do just that, however, when she donned a gold cape-blazer-dress that made her look like an Oscar statuette come to life. The custom Carolina Herrera creation was completely hand-embroidered with "more than three million glass bugle beads applied to an inner gown corset," reported Entertainment Tonight. As it that wasn't enough, it took more than 40 craftsmen to hand-stitch all of the beads "in radiating lines that were engineered to match the shape of the pattern in order to create a smooth, continual shape over the seams of the gown." When all was said and done, the 71-year-old best actress nominee for The Wife was tasked with wearing a gown that, as the actress told The Cut, weighed 40 pounds! Was it worth the weight? We're not so sure. Gemma Chan, are you in there? Fact: There is such a thing as too much fabric. 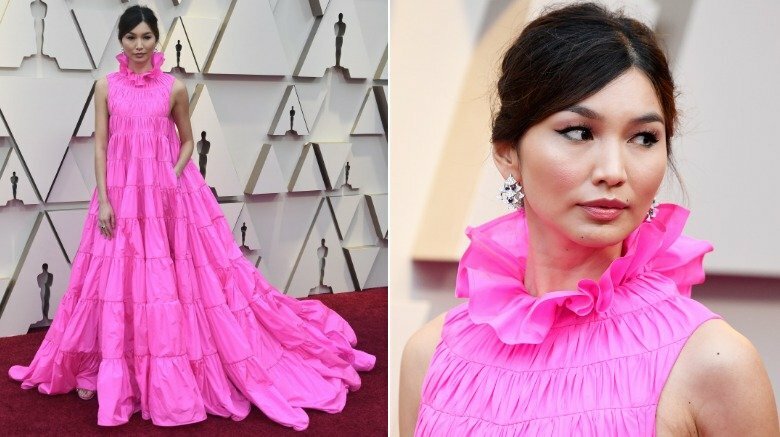 Gemma Chan, who is usually impeccably stylish, proved that first-hand when she was completely overpowered by her hot pink number. The ruffled Valentino gown had a high statement-making neckline, pockets, a long train — basically, all great things — but there was just soooo much ruching. More than any one person needs, really. Described by Harper's Bazaar as "parachute-like," the dress, which debuted on the Valentino couture catwalk in January 2019, looked exactly like that — a parachute. And not a cute one (can parachutes even be cute?). This gown was on a mission to engulf the petite star of Crazy Rich Asians and totally steal her spotlight. It drove the 36-year-old star off the top of the fashion pyramid and onto several worst-dressed lists, including round-ups in the Mirror and USA Today. More like Crazy Rich Bad. What in the world? 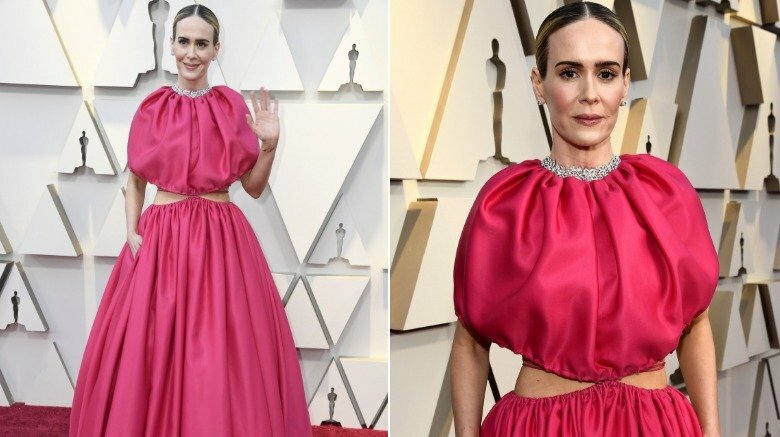 Ocean's 8 star Sarah Paulson, 44, certainly got the memo that pink was the color to wear to the 2019 Oscars, but we're not sure what happened after that. Peek-a-boo cutouts are not exactly the first thing that pops into mind when thinking of the most glamorous event of the year and yet, that's what Paulson opted for. Why? We have no idea. The fuchsia frock was designed by Brandon Maxwell, reported Just Jared, and came complete with a bizarre sewn-in diamond choker necklace, tons of overwhelming ruching that seemed to bunch up in all the wrong places, and two very daring and very unflattering cut-outs at her sides. Making matters worse, there appears to be a string holding everything together at the waist, which appeared in photos and made the entire outfit look even more sloppy.